Michael Weber's "Do Your Homework"
Years ago in MAGIC, Michael Weber published a list of his favorite magic books to read when you're tired of the "classics", but need ideas for new performance material. (I don't remember the reference off hand, but I'll bet Bill Mullins does! ) It was, and is, a wonderful article. In a related vein, the latest Penguin Magic Monthly contains a dandy little article by Michael Weber called "Do Your Homework". In it, he not only expounds on the notion that magic is a meritocracy and about the value of face time (the activity, not the app), but also stresses the fact that if you want to hang with the big boys, you have to pay your sweat equity in terms of developing a working knowledge of the magic literature. To that end, he sends his readers on a scavenger hunt of sorts by pointing out some buried jewels to research in books you probably already have resting on your dusty shelves. Not only is this a lot of fun, but the dirty little secret is that by participating in this exercise you'll probably come across items he doesn't mention that will tickle and inspire you. If you participate, I predict you'll say at least once: "Aha...so that's where that's from!" (For example, I laughed when I realized that an idea that the best comedy magician in the world turned into a trademark routine was published in "Scarne's Magic Tricks" in 1951--and it was an old idea then!). More than that, by combing through these references, the student can begin to develop that crucial broad knowledge that Mr. Weber speaks of. I love the fact that Penguin published this article where it's likely to be seen by some of the new generation. Anything that gets them into magic's rich published legacy deserves a "Huzzah!" in my book. The article is well worth checking out for us oldies too! Good on you, Penguin--and thanks Mr. Weber! I will have to check out that article. Along similar lines - I was a huge fan of the Speaking Volumes article by David Regal. It was in GENII back in June, 2002. It is my all-time favourite article from a magic magazine. Really great fun. I remember Michael Weber's column on old magic books as well. One month in MAGIC magazine he devoted his product review column to classic books that were released decades earlier. In order to show magicians that there was a lot of great magic waiting to be rediscovered in books they already own. Scarne's Magic Tricks was the book he really went out of his way to promote in that column. I love sharing interesting ideas that are buried in print. I once had a column in Chris Wasshuber's email mailing list where I would share recommendations. Here is a 'cut and paste' for those who like this sort of thing. 1) I am huge fan of Gregg Webb. He is a talented creator and a remarkable illustrator of magic. Outside of magic he worked in Hollywood on the special effects for the first Predator movie. His wild illustrations pop off the page and really get you excited about the ideas he is sharing. His enthusiasm is contagious. And I hope mine will be as well as I discuss his work. FEEN-X was the first magazine of his that I ever read. And it may be his best. FEEN-X was named in tribute to the legendary Phoenix magazine (say "FEEN-X" out loud). Like that magazine - it is packed full of intelligent advice and practical magic. Gregg says that 90 percent of magicians are doing the same 10 percent of magic. And he wants to encourage magicians to seek out what is old and out of fashion. Gregg is always looking to challenge the unquestioned assumptions that magicians bring to their choice of material. All of Gregg Webb's magazines are superb. And having sampled one - I am sure you will want to track down the rest of his output as well. They all have my highest recommendation. A strong point of Gregg's writing is the thought he puts into his magic. He is always looking to add offbeat methods to his tricks in order to get the most effect for the least amount of effort. Gregg thinks magic should be fun to watch - and fun to perform. He feels that if the magic you perform doesn't appear effortless - then it will not appear truly magical to the audience. A big point in Gregg's thinking is to encourage us to stop thinking like magicians and work on tricks that are stronger in practice than they might appear in theory. Laypeople think differently to magicians - and Gregg wants to understand how laypeople perceive magic so that he can to fool them in the cleanest manner possible. Despite the emphasis on magic that will fool laypeople. It is Gregg's view that a trick doesn't have to be hard to be good. And thanks to Gregg's obsession with simplicity - he often has a few subtleties which will fool magicians as well. I am not a coin guy. But I love the sneaky coin transposition called The Odd Coin that he teaches. It is super easy to use - and uses a devious move which will catch magicians and laypeople out. Gregg says this one move is worth the price of a year's subscription in itself. And I agree. It is rare to see a self working coin trick which will fool laypeople and magicians. This effect is a good example of the raw creativity and boldness that Gregg approaches his magic with. Throughout the magazine, Gregg offers his opinions on a range of different issues and also includes his thoughts on the latest books. He has advice on how to strengthen the effect of manipulation acts. And he has an excellent suggestion as to why turning your prediction effects into thought reading effects will make those tricks much more effective. Since reading this - I have converted all of my prediction effects into thought reading effects. Another highlight is The Magic Card. It is an easy to do series of transpositions involving a signed card and a card case. This effect contains thinking you will not find in most card effects. And is an example of how looking at magic tricks from the point of view of laypeople opens doors to new ways of constructing magic tricks. In this case a small subtlety greatly simplifies the method. NOTE: Check out The Book That Doesn't Exist which is another magazine from Gregg for an addition by Charles Reynolds which greatly improves this trick. Gregg Webb is a big fan of the massive tome, Mind, Myth and Magick by TA Waters. And in the magazine he shares his thoughts as to which effects are his favourites from this book. Useful advice for those looking to make their way through these huge books. Another coin effect includes Gregg's ideas on how to adapt a standard card sleight for use with coins. Later in the magazine you will find a coin sleight adapted for use with cards. Elsewhere - Gregg offers a unique multi-phase presentation for the Monte effect. And he offers his advice on why if you structure your magic tricks the correct way - it will not matter if your tricks are examinable or not. This is another example of Gregg pointing out that magicians worry about the wrong things - and overlook the simple solutions which are staring them in the face. Throughout the magazine - Gregg details a number of mentalism effects. In each effect - the addition of a small bit of movement provides a visual touch which turns the trick into a miracle. This is a simple (but underused) strategy for increasing the impact of these types of effects. Gregg also includes a homemade version of a popular marketed coin gimmick. It is lovely to see a creative mind at play in this way. And at the end - Gregg discusses the advantages his homemade gimmick has over the standard gimmick. Sneaky thinking can be found in Transpo HPC in which Gregg makes use of simple gaffs to fool magicians who will think he is using a particular sleight. In one of the later issues - Gregg tips a sneaky spoon bending routine he once used to fool a science professor. And details a nice handling of Jim Steinmeyer's Nine Card Problem which ensures the original effect is clarified, so that the fascinating principle behind it can shine as brightly as possible. There is a lot more good stuff in these magazines. Tricks, opinions and tips galore. And a wide variety of magic. It is one of the best magic magazines I have ever read. And has had a bigger impact on my thinking than just about anything else I have read in magic. Gregg captivates you with his passion for simplicity and fun in the tricks he has created. Over the next few issues - I will be pointing out other excellent tricks that are 'buried in print' and scattered throughout the landscape of magic books. Too much great magic is hidden in plain sight. And I plan to unearth some of it. This is my first column. And it is a little longer than the others will be since I wanted to spend some time sharing my passion for the work of Gregg Webb. 2) Check out Hidden Agenda by Peter Duffie. In there you will find Divisory Capacity which is the best self-working trick in the world. And Carter's Fooler which makes use of a little known principle for keeping a stack in play after the spectator has shuffled the cards. It makes for a lovely magician fooler. 3) Impromptu Card Magic by Aldo Colombini has a great spelling trick by Eddie Joseph. Check out A Sort of Spell. It has a very fair feel to it (the trick involves shuffling the cards before the spell) which caught me by surprise when I first used it. 4) The Book That Doesn't Exist is another great magazine from Gregg Webb. It is worth checking out the updated handling for The Magic Card in here since it is one of Gregg's best tricks. It is also the trick that made me fall in love with his way of approaching magic. The Bart Harding Stack is also tipped in this magazine. This is my my favourite card stack. It is an amazing discovery. Imagine a card stack which looks completely random and which can be memorized in just 5 minutes. Also - once you have memorised it - it is impossible to forget it for the rest of your life? This stack delivers on that promise thanks to the ingenious idea which underpins it. 5) Check out Martin Gardner's Science Magic Tricks. The book is full of unusual principles waiting for further use in magic. One that stands out is a test conditions effect involving guessing whether or not an imaginary coin has landed Heads or Tails side up. It is a small trick. But thanks to the ultra fair conditions - it is the sort of thing that could pass for the 'real thing' if staged correctly. 6) In Spellbinder magazine - check out Christmas Cord by David Britland. This is a great little cut and restored rope. And also doubles as my favourite use for Stewart James' wonderful Sefalaljia principle. 7) Applications by Peter Duffie has a trick which is the best use for the Dr Daley principle of showing 2 queens as 4 queens I have come across. 8) Check out Psimatrika by Leo Boudreau for my favourite book test. With a bit of preparation - it can be done with books from a friends library. Nothing is said out loud or written down - and the books are not prepared in anyway. And you are out of the room when a word is chosen. It doesn't get any fairer than this. The interesting thing about the method is that it doesn't work with one book and can only work when using 4-5 books. I always thought it was neat that the principle in play only works when the effect is made even more impossible. 9) Close-up Framework by Lawrence Frame has a little known Jerry Sadowitz trick. And it one of his best. It is a repeat 4 ace assembly - with the second phase done in the spectator's hands! 10) Pascal Monmoine is a long forgotten creator. But he had some brilliant ideas scattered through the magic magazines in the 1980's. Check out his Card Through The Table...From A Distance and The Domino Effect from Pabular magazine. 11) Bolivian Brain Bafflers by Marvoyan has a brilliant technique for invisibly passing an object from an assistant in another room to the magician. This would be a great technique to use for an impossible version of the 'Any Card At Any Number' plot. 12) Classrooms & Scenic Routes by Ben Highway is worth checking out. In there is a very strange method for a Monte effect. It makes use of a sneaky dual reality in which both spectators listen to the same word - but hear different words. This is the basis for an impossible clean phase in the Monte routine. Wonderfully odd thinking here. 13) Subtle Miracles is my favourite Peter Duffie book. It is packed full of amazing card tricks which make use of unusual gaffs. Buried in there is a wonderfully clean method for making a freely thought of card vanish and appear stapled to a letter which is untouched and resting inside your pocket. Another thing to note is that the first trick details a handling for the Hamman Count which is much cleaner than any other handling I have seen. The book also contains one of my favourite tricks which happen totally in the hands of the spectator. It makes use of gimmicks and gaffed card cases. And as such is much stronger than the usual mathematical effects which usually form the basis for these type of effects. 14) Mind Blasters USA compiled by Peter Duffie contains some great mentalism effects. Sugar From The Orient by Christopher Taylor and Matthew Johnson makes use of a new principle in mentalism. Not only is the trick impossibly clean - but it is 100% impromptu! Kenton Knepper also has an effect which makes use of a tin box used to hold candy. The trick makes use of a lovely topological touch which would be of use in other tricks which involve predictions held in boxes wrapped by rubber bands. 15) Mind Reader's Digest by Bob Somerfeld has a lovely mentalism trick which makes use of an unusual principle which I have only ever seen once before. Indeed - the opening trick of this book is the first time I have seen this principle (which makes use of sound in an ingenious way) in print. My favourite use for this principle is The Color Out of Space from the Feb, 1989 issue of GENII. It was later reprinted in Richard Kaufman's excellent Japan Ingenious book. 16) Miraculous Minds compiled by Peter Duffie is worth looking up. In there is a trick by David Lees called One From Three. This trick ads extra smoke to the old Mathematical Monte effect by Bob Hummer. This touch will catch out magicians familiar with the Hummer principle. 17) Carbon Footprints by Paul Gordon has a lovely version of '51 Faces North'. The trick makes sneaky use of a stooge - but the method is so counter-intuitive that a stooge will never be suspected. 18) A Brainstorm In Glasgow can be found in Peter Duffie's book Cards In Principle. The construction of the trick is remarkable and what tickles me is that it is the only decent trick I have ever seen which makes use of the hoary down/under deal. 19) Cards On The Table by Jerry Sadowitz. This book has the best version of Hofzinser's 'Everywhere and Nowhere' (this version makes use of signatures). And has a brand new plot in card magic in a trick called The Backwards Card Trick which has a weird Paul Harris feel to it. 20) Check out Thanks To Collins by Steve Hamilton. This can be found in Scotland Up Close which was compiled by Peter Duffie. The trick is a rediscovery of an amazing principle by Stanley Collins. The principle allows the spectator to tear up a card and freely choose a corner to keep. The other three corners are destroyed - and now the spectator's card can be made to appear anywhere you want. No gimmicks are used. And the corner stays in the spectator's hands at all times. I would love to see more magicians make use of this principle. Over the years I have found that my tastes in magic have changed by quite a lot. One thing I enjoy doing is digging out old magazines from the 90s (mainly Magic and Genii, TBH) and rereading them with fresh eyes. There's always something in there that I glossed over the first time round. Is this in the January 2017 issue? Nope - the December 2016 issue. Mr. McKay is correct: "Do Your Homework" is in the December, 2016 issue of Penguin Magic Monthly. Fellow Psience Members will notice the Latin phrase that ends the introduction to every issue of the Journal. Inspired by this thread - I spent some time in the GENII archives reading through David Regal's superb 'Speaking Volumes' article and the follow up columns he did as well. For those who want to dig through them online - here is a guide to who was featured. In each case the magician involved was asked to recommend one or more tricks in print that they thought were both excellent and overlooked by most magicians. I also tracked down Michael Weber's recent article (in Penguin Magic Monthly) and really enjoyed seeing what recommendations he had as well. I just stumbled across something else which will fit in nicely with this thread. Back in 2006 - MUM magazine started an interesting column in which a classic magic trick was discussed each month. The column was called 'REMIX - Pages of the Past Plugged into the Present'. Each column starts with a short history of the effect in question and finishes by reprinting different approaches to that trick which have appeared in MUM magazine over the decades. It was a great idea for a column. Anyway - for those with access to the back issues - the following is a quick overview of which tricks are discussed. If you have access to Ask Alexander - the above information will help you quickly find whatever topic you are searching for. Just run a search for this phrase - "Pages of the Past Plugged into the Present" - and check out the results for the volume in question. The third reference in Michael Weber's article is to one of my favourite books, Magic Digest by George B. Anderson. Not only is it full of gems but he also teaches you how to routine the tricks. One chapter always stood out for me, and that is about the rope escape. It is a complete act that could make you a lot of money. I've never done it but it is obvious George, or a very good friend of his had done it - a lot. That chapter came to mind a few years back watching a performer's full evening show with 800 in the audience. He had trouble and it went wrong, taking a long time for him to escape, even so with great difficulty. But as soon as he started, I said to myself, "He's never read the Anderson book." And waste its sweetness on the desert air"
I believe he was referring to the trick on page 6 of My Favorite Easy Mental Card Magic by George B. Anderson. Thanks to Mr. McKay and Q -- appreciate the references! The print in my Signet copy of Scarne on Card Tricks is getting a little small for these old eyes, so I decided to hunt down a copy with bigger print. 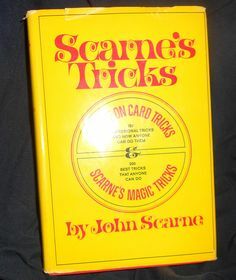 I was delighted to find a hardbound book called Scarne's Tricks that contains the complete text of Scarne on Card Tricks AND Scarne's Magic Tricks. It only cost me $9 on ebay for an almost new copy that I can read a little more comfortably. While researching Mr. Weber's recommendation, I came across the trick on page 13 (Traveling Aces) with which I just fooled someone badly (using a more sophisticated force). One of the biggest secrets in magic are the Karl Fulves Dover Publications that you can find in most bookshops. There is a ton of great material in those books. A lot of magician foolers as well. People complain it is hard to find Karl Fulves's various out of print magazines. But it is worth remembering that a lot of that material has crept into print through these books. Every magician should own each of the 'Self-Working' books he has written for the public. Even if you feel the contents won't interest you. There is enough variety of material in there that you are sure to find some hidden gems that are often only tangentially related to the title of the book. For the sake of completion - I will mention that Karl Fulves has also written Easy Magic, Easy-To-Do Magic Tricks for Children and Easy-To-Do Card Tricks for Children. But if I remember correctly - they did not strike me as being as essential as the other books on this list. The Dover magic books were discussed previously here. In the July, 1993 issue of MAGIC magazine - Michael Weber did something unusual with his product review column. Instead of reviewing the latest books - he recommended books that were published 40-50 years earlier that he felt more magicians should be familiar with. There is a lot of great material 'buried in print' to dig through. Another great resource is the forum's own Book of the Month club. Joe Mckay wrote: In the July, 1993 issue of MAGIC magazine - Michael Weber did something unusual with his product review column. Instead of reviewing the latest books - he recommended books that were published 40-50 years earlier that he felt more magicians should be familiar with. Alas, this issue is missing from the Genii online archive. Check again. I am able to view that issue. Can you see all the pages? I can't. I can, but occasionally I see a blank page either until it loads, or if I refresh the page. erdnasephile wrote: Thanks to Mr. McKay and Q -- appreciate the references! You definitely got a steal there, Erdnasephile! Nice going! Scarne on Card Tricks was the first book on card magic I ever got (eons ago). It is a wonderful book. You have that book (150 card tricks) and Scarne's Magic Trick book (another 200 tricks) all under one cover. Yes, the Traveling Aces is a solid trick, very clever, and an excellent example of what can be done with well-timed misdirection and subtlety. Scarne states that it Traveling Aces is "One of magician Charlie Nagel's favorite tricks." Course that doesn't mean Charlie created it. It mentions Charlie Nagel in association with the trick with a date of 1950, but without mentioning where published. Inferentially, that is a reference to Scarne on Card Tricks (published in 1950) where the Traveling Aces appears and is noted to be one of Charlie's "favorite tricks." But the Simplicity Aces, published in 1938 by Stewart James, would appear to be the original name of the trick, and thus, James the original creator. I highly recommend Mark Elsdon's (ebook and/or printed booklet) Hidden Gems. He lists over 100 gems of magic that are largely unknown and where to find them. I read this awhile ago and really enjoyed it. He did a great job uncovering hidden gems. Just received Scarne's Magic Tricks. Looks awesome. Thanks for the heads up. Q. Kumber wrote: I highly recommend Mark Elsdon's (ebook and/or printed booklet) Hidden Gems. I second that recommendation, having just got my copy of Hidden Gems. It is a fun read in its own right, and has now launched my on a "scavenger hunt" through my library to re-read the material that he recommends. It is gratifying to see that I already have many of the sources that Mark recommends, and will of course have fun finding the rest. One common denominator that seems to run through the material in "Hidden Gems" is a high entertainment value, as well as a high "magical" content. Not a set of recommended "tricks" per se. Remember this is a listing of material with brief descriptions of the effect and why it made the list. This is not a collection of material, methods or presentations. Special thanks to Mark and Deborah Eldson who persevered through email glitches to make sure that the ebook got through to me. Always nice to see customer service in action and to know that it is still alive and well. We ran a very lengthy story by David Regal in Genii, which then turned into a monthly column, called "Speaking Volumes." David canvassed well-known magicians for great tricks which they felt were hidden in the literature. So, this has been done before. This thread contains notes by Fred Braue giving his thoughts on the tricks that were published in the early volumes of Hugard's Magic Monthly. One of the ways I try to understand magic history is to learn more about the tricks that caused a "buzz" in the world of magic. Sometimes this would be a stunning trick that won a prize in a magic competition. Or a trick that was kept quiet by the inside guys before leaking out into the wider magic community. My favourite example of this is when somebody re-discovers an old trick in a magic magazine and it goes on to become the talk of magic. A couple of years after getting interested in magic, the buzz surrounding Guy Hollingworth's The Reformation was reaching a peak. And it was a trick I was desperate to learn. So this is an aspect of the magic community that I can relate to. An earlier example of this was The Crazy Man's Handcuffs. This was buried in an old magic magazine and then improved on by Herb Zarrow. And a few years later - it exploded across the magic world when Michael Ammar popularized the trick. A similar thing happened when Doc Eason took an old trick, improved it and then unleashed the Anniversary Waltz on the magic community. These tricks are modern classics. And it is always interesting to think back to a time when they were not tricks taken for granted by magicians - but something new and exciting. The trick is so strong that David Copperfield performed it twice on his TV specials. Anyway - I was reading Michael Ammar's instructions for the CMH. He mentions that the principle behind the trick is reminiscent of something that Richard Ross bought to the linking rings. The use of depth perception to fool the audience. The human eye finds it hard to tell if something is in front of - or behind - something when using objects like rings (or in the case of CMH - rubberbands). I am not a linking ring guy myself. But I looked up Richard Ross's routine and it is indeed very special. I can understand why this trick created a buzz among magicians back in the 70s. Ross won the Grand Prix at FISM. And many said it was due his beautiful new handling for this classic of magic. Anyway - all of this is just a preamble to explain why I want to link to a great post I have come across on The Magic Cafe. It turns out the key move to the Richard Ross routine was buried in an old Laurie Ireland booklet. And it is nice to be reminded again of all the great ideas sat buried away in dusty old books and magazines. And that fits nicely with Michael Weber's lesson of "Do Your Homework". Slydini's Linking Pins works the same way: the illusion is that the staff is on one side of the other pin, while in reality it has already moved to the necessary side. Magicians don't understand this about the routine because they can't get the Andrus routine out of their heads. I wish I had video of Slydini performing the routine. It was certainly more magical than the Andrus routine. Same thing with Mike Caveney's impromptu linking coathangers. The strangest example of this principle is a weird optical illusion by Jerry Andrus. And here is a video of Jerry showing the optical illusion to Richard Dawkins. Speaking of the linking rings, I think a great climax would be to put away all but two ungimmicked rings. Have them examined, then take them back and immediately link them, using the Caveney method. I don't do the rings but if I did, I would definitely try this. I think it would be a great finish; simple, elegant, classic. And it would completely cancel the key ring as a method. I saw Jerry Andrus do "Ghost Grate" one afternoon at Scot Morris's apartment on the upper west side of New York. Illusion was great. He had a set of lecture notes that he had prepared for Ghost Grate, on which he had spoken at Harvard (I think).